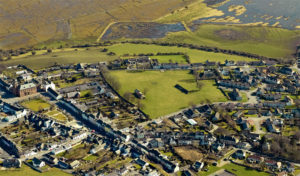 The Wigtown & Bladnoch Community Initiative is a company registered in Scotland, established in 2016 to further the achievement of sustainable development in Wigtown. to provide or advance the accessibility of recreational, facilities, and/or organising recreational activities, which will be available to members of the Community and public at large with the object of improving the conditions of life of the Community. advancement of citizenship or Community development, including rural or urban regeneration. 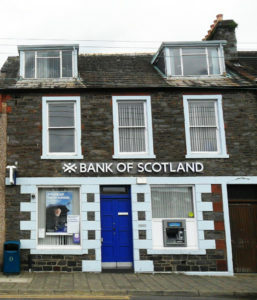 Wigtown & Bladnoch Community Initiative has a registered Community interest in 21 North Main Street, Wigtown – the former Bank of Scotland building. What is proposed for the building? Affordable flats – convert upstairs into a family size affordable flat; and convert the back part of the ground floor into a fully accessible one bedroom affordable pensioner flat. These tenancies would be for people with local connection; our research has shown that there are lots of people struggling to find good affordable accommodation in the town, so this would help. Bunkhouse and community space – convert the main “retail” area of the bank that opens off the square into a bunkhouse for visitors with an internet hub. Similar to the bunkhouse idea at the Barholm Arms in Creetown, affordable holiday accommodation for pilgrimage, walkers, cyclists and so on is lacking in Wigtown. And at busy times, there is just not enough holiday accommodation in the area. Offering maybe 8 bunkhouse beds would mean that more people can stay in the town, and they’d shop and eat and drink at local businesses as they appreciate our wonderful town and the surrounding Machars countryside. Also, we hope we might be able to get some community banking into the internet hub part time, because a lot of people have told us that some sort of banking would be a real bonus for the town, as well as being a link back to what the building has been used for, for decades. These ideas come from the local community. The bunkhouse idea is different from what other businesses and organisations do in Wigtown and Bladnoch. There would need to be work done on the building whatever is decided, but for these proposals it looks like there could be several sources of funding to get the work done. And once it’s up and running, there will be some income which means we should be able to create some employment such as helping to manage and clean the bunkhouse. Please help us Let Wigtown Flourish. Can Wigtown bank on your support? The Old Showfield on Southfield Lane has stood empty and neglected for nine years. Wigtown & Bladnoch Community Initiative has been formed to regain community ownership of the Showfield. We feel that it would greatly enhance Wigtown. Initial ideas for the future use of the Showfield have included affordable housing and business units, an area for outdoor events with space for a marquee and parking, a community orchard and various projects. Using Community Right to Buy legislation, the Scottish Government has given us the right to buy the land if the current owners put it on the market. If that happens, we would apply to the Scottish Land Fund for a grant towards the cost. Unfortunately the owners, 3b construction, have a planning application for 43 houses (of various sizes) for the old showfield. For the present, therefore, we are waiting to see what the Council decides about their application.